The Locust was designed for the person who has large volumes of plant material to process. 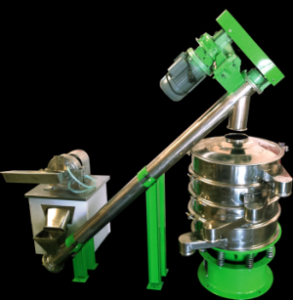 The Locust is a continual processing environment that includes a grinder to reduce the size of the plant material, a conveyor to carry the plant material from the grinder to three ultrasonic vibrating screens that generate and grade the high quality kief that is produced. At the end of the process the ultrasonic vibrating screens deposit the graded kief into the protective bags used by Grasshopper Protector; ready to be vacuum sealed in an atmosphere of pure nitrogen. The Locust can process over 500 pounds of plant material a day with yields of between 15 and 20 percent of high quality kief. Of course the actual yield is also determined by the quality of the plant material being processed. The three ultrasonic vibrating screens are 160, 100 and 74 microns. There is no other machine or machines that can handle the volume of plant material that the Locust can handle. It takes waste and produces profits. Watch the Locust in Action!